In Westlake Village go north of the Ventura Freeway on Lindero Canyon Road and enter the community of Oak Park. After Lindero makes a sweeping right turn and heads east, look for King James Court on the left. Park on Lindero; walk north one block on King James to the trailhead. Let's be polite and not park on King James Court. China Flat is a grassland and oak woodland. The trail to it is steep and rocky, gaining one thousand feet on a sun exposed slope before reaching the Flat. 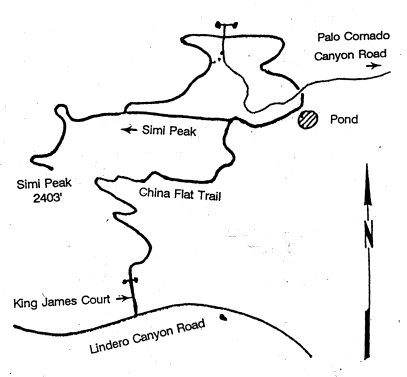 Simi Peak is a 400' elevation gain from China Flat but on a reasonable grade on a respectable trail. China Flat itself is near a state of original purity. Mother Nature's changes to man's occupation are gradually restoring the land to its natural splendor. This is a treasure to be preserved. A sign posted at the China Flat Trail asks that we use the "Primary access" trailhead just east of King James Court. I have done this alternate several times and I do not recommend it. Parts of it are at a 30o grade on unstable rock with an unnecessary exposure to injury. The improved trail at the end of King James Court is steep enough and much safer so use it. Yesterday (9/10/1998) thinking I could be prejudiced, I walked the trail east of King James. When halfway up the 30o grade on this miserable section I looked up to see a more or less friendly Southern Pacific Rattlesnake watching my struggles. He was in the middle of the trail and must have concluded that I was having enough trouble so he moved to the side and let me pass. Needless to say I was alert on my entire hike, and at the end exited at King James Court. We start uphill, and most of us should deliberately conserve energy because a one-thousand-foot gain on a rocky trail deserves respect. Fifteen minutes into our hike we notice a short trail headed toward a moss-covered wall of rock. Water drips from a seven foot cliff into a clearwater pool. Scarlet Monkey Flower and Fuchsia survive where moisture is present. A nearby cave - just big enough for one person - might have been a shelter for a native family hundreds of years ago. Although Yerba Santa and Santa Susana Tarweed are found elsewhere in the local mountains, they are usually growing in places that require individual energy to find. I cherish their presence here. Santa Susana Tarweed is on the endangered species list but is prolific here. Hundreds of plants border the trail and are among the rocks and cliffs. Run your hand along the leaves, it smells like raspberries to me. When we get to China Flat we will see Slender Tarweed that has a similar appearance, but not the raspberry smell. We reach the crest of our trail in fifty minutes. A row of huge boulders and a substantial, locked gate prevent trucks and other motor vehicles from making the mistake of trying to use the trail we just came up. We go around the gate and start a big turn left as we descend into China Flat. We soon leave a chaparral forest to enter an oak woodland. Fifteen minutes and a 200-foot elevation loss later, look for and take a trail on our left. This trail heads west and contours around the northeast slope of Simi Peak as it climbs 400 feet in about one mile to reach the summit. We may already be winded but the view from atop Simi Peak will leave us gasping. At 2403 feet it is the highest point in the area. We look south and see the streets and houses of Oak Park. To the north, Simi Valley is visible. On the southern horizon, both east and west, the Santa Monica Mountain range dominates the view. We deserve the scenery - we climbed up here. On our return from the peak we can take a left fork in the trail when we have walked about ten minutes. Steep in a few places and not as well used as the main trail, it takes us to the north border of the Park. This may change in time, but for the last few years this trail takes us from meadow to meadow of Turkey Mullein, an annual, spreading, gray plant. Flowers bloom all summer until October but it doesn't matter, we need a magnifying glass to see them. We then turn right to go east two-thirds of a mile - passing a cave on our left and crossing a north/south road. As the trail makes a sweeping right turn, it loses altitude. A pond and other signs of ranch use is in view. A trail leaves the north end of the pond and for awhile parallels the road (Palo Comado Canyon Road) going west. In less than one half mile we intercept the trail we came in on and follow it to the trailhead.